Spacious and open 4 bedroom, 2.5 bath, 4 car detached garage 2 story home. The 4th bedroom is located downstairs and has an attached half bath and could potentially be an office, family room, etc. 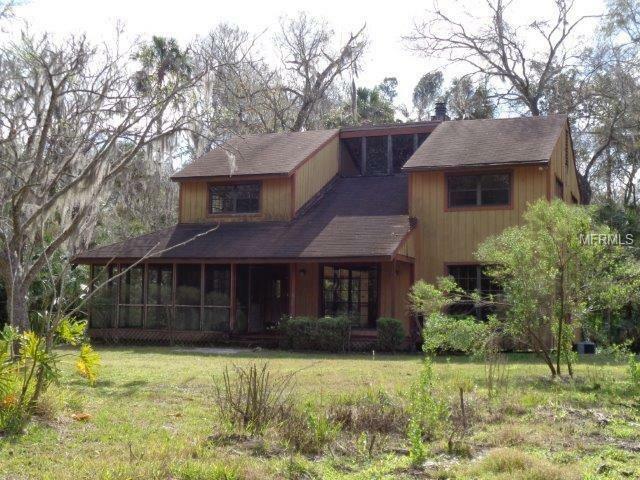 This stilt home is located on 4.92 acres close to the Alafia River with no HOA . Bring your boat, RV and all your toys. The extensive from porch is screened for enjoying those quiet summer nights. Inside the front door the soaring ceilings welcome you as does the 2 story fireplace and the classic wormwood paneling. With a little work and your touches, you can make this unique home, a gracious mecca for entertaining and enjoying. Dont miss this opportunity. Located just minutes from the Alafia public boat ramps at Riverview Park, US-301, I-75, shopping, restaurants, entertainment and more. This is a Fannie Mae Homepath property. Pet Restrictions Verify Pet Restrictions With Hillsborough County.